For the first many years of my deprived life, I looked at the dish of cold, watery Brussels sprouts being passed around the Thanksgiving table . . . and wished I didn’t have to be polite and eat a few. But in early October last year, it was like the media suddenly grew a crop of delicious Brussels sprouts stories and recipes. I read them all, jotting notes in my head, thinking maybe, just maybe, they didn’t have to taste like little cabbage heads that had drowned in a particularly bland sea of ice water. When the time came for my Thanksgiving challenge (i.e., my mother in law put me in charge of making the little cabbage heads), I rose to it. I parboiled the Brussels sprouts in salted water to make their hard hearts tender and tasty. Then I rolled the little cabbage heads in a frying pan with pieces of bacon, slices of garlic and apple cider vinegar. Their outer leaves browned happily while I decided to add some pepper and roasted pine nuts in the oven. They stayed happy – and alive. No cold, drowned Brussels sprouts for us. Instead, we had beautiful little browned cabbage heads with barnacles of bacon, garlic and pine nuts drawing out the Brussels sprouts’ true flavour. Finally: yummy Brussels sprouts to be thankful for. Bring a large pot of salted water to a boil. Throw in the Brussels sprouts. 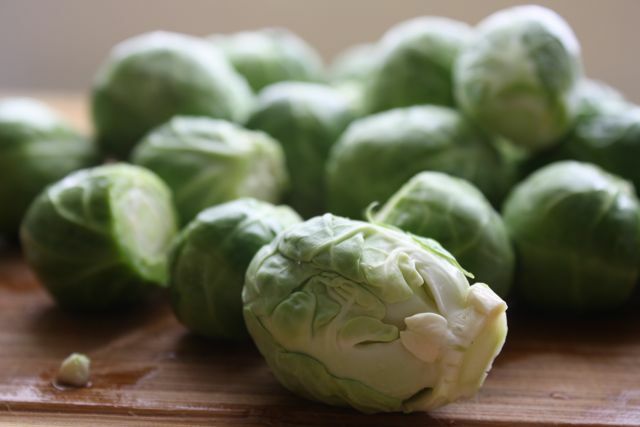 Cook the Brussels sprouts until they are almost tender, but not completely cooked, about 6 to 8 minutes. In the meantime, fry the bacon for 5 minutes in a good frying pan over medium-low heat. (If using thinly-sliced bacon, fry for 1 – 2 minutes.) If the bacon releases a lot of grease, feel free to pour some off. Sauté until the bacon is done and the garlic has softened. 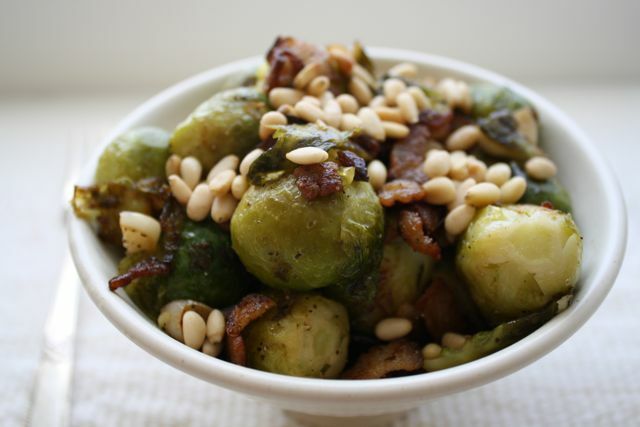 Serve with a generous sprinkling of roasted pine nuts on top. This does look yummy, Stephanie, but some of us actually enjoy the simplicity of plain, lightly steamed Brussels sprouts served hot or cold! Their distinctive flavour doesn't need to be enhanced or disguised. Even if overcooked, I love having leftovers to eat cold for breakfast or snacking. Brussels sprouts have been a favourite vegetable since I was a small child.